SCP-3637 after transfer to a museum. Special Containment Procedures: As of Incident 3637-A, 3637-Ramah events have ceased completely, and SCP-3637 has been reclassified to Neutralized. One year after Incident 3637-A, SCP-3637 was fully excavated and transferred to a museum operated by a Foundation front. The area within a one-kilometer radius of SCP-3637 is to be surrounded by a 8-meter-high barrier, with guards posted every 200 meters. If SCP-3637-1 attempts to breach the barrier, it is to be deterred using high-pressure water hoses. Description: SCP-3637 is a fossilized Maiasaura skeleton excavated 8 km east of Bynum, Montana during a paleontological dig. Upon initial excavation of SCP-3637, a loud roar was heard by the paleontology team, with no apparent source. SCP-3637 will undergo a single 3637-Ramah event every time a thunderstorm forms or passes directly over SCP-3637. During a 3637-Ramah event, wind speeds in the vicinity of SCP-3637 will increase to around 140 kph, a loud roar will be heard, and salt crystals within a 119 m radius of SCP-3637 will be drawn towards it and cover it completely. 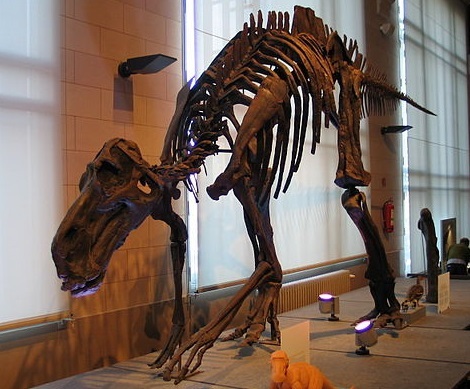 A lightning bolt will then strike SCP-3637 directly (SCP-3637 is undamaged by this), and the salt crystals will coalesce into the form of an adult Maiasaura skeleton, hereafter designated SCP-3637-1. SCP-3637-1 will then extricate itself from SCP-3637, and walk away. Wind speeds will return to normal, concluding the 3637-Ramah event. SCP-3637-1 tends to wander aimlessly, occasionally vocalizing and digging into the ground with its forelegs. SCP-3637-1 will continue to wander and dig until rain degrades it to a point where it is incapable of locomotion. SCP-3637-1 is noted to vocalize loudly and dig more rapidly and frantically as it degrades. Rain will continue to fall in the vicinity of SCP-3637-1 until the instance dissolves completely. Only one SCP-3637-1 instance can exist at a time; a 3637-Ramah event will not occur again until the current SCP-3637-1 has dissolved. SCP-3637-1 is capable of remembering previously-dug areas as well as specific Foundation personnel; leading theories to explain this phenomenon are that SCP-3637-1 is either the same entity appearing repeatedly, or a group of entities sharing a collective memory. Incident 3637-A: On 5/13/18, a Foundation paleontology team excavated a nearly complete Maiasaura nest, including several dozen fossilized eggs, approximately 11 km from the location of SCP-3637. A 3637-Ramah event immediately occurred at the location of SCP-3637 despite the lack of rain, and the resulting SCP-3637-1 immediately vocalized loudly and proceeded to run directly towards the nest. SCP-3637-1 then absorbed salt from the ground, growing in size to a length of 15 m, and easily scaled the barrier. On-site personnel attempted to neutralize SCP-3637-1 with high-pressure water hoses but were unsuccessful. SCP-3637-1 then shed the excess salt, returning to its original size of 9 m, and continued course to the nest. Personnel at the nest were advised to stand down while backup was scrambled. Upon reaching the nest, SCP-3637-1 lay down next to it and nuzzled the fossilized eggs, before collapsing into salt crystals.